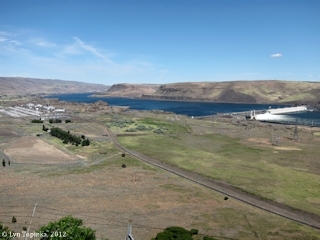 Click image to enlarge John Day Dam, as seen from Giles French Park, Oregon. Image taken May 24, 2005. 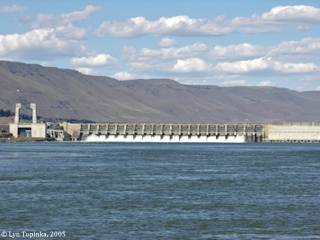 The John Day Dam crosses the Columbia River at Columbia River Mile (RM) 216 and is located at Exit 109 off Interstate 84 in Oregon, at the Oregon town of Rufus. 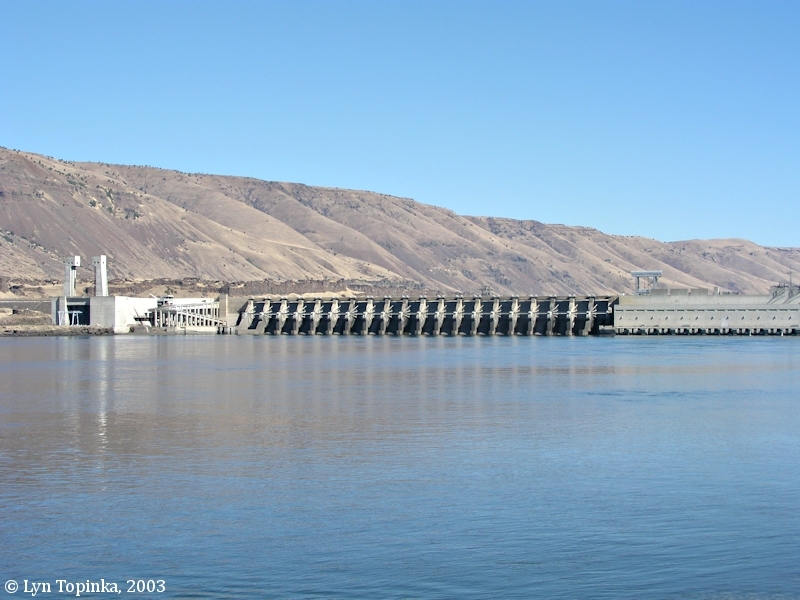 The John Day Dam is at the head of Lake Celilo, the reservoir behind The Dalles Dam, located 25 miles downstream. The reservoir behind the John Day Dam is known as Lake Umatilla. The John Day River, draining Oregon's Blue Mountains, is located two miles upstream of the John Day Dam. Seven miles downstream of the Dam is the Sam Hill Memorial Bridge, connecting Biggs/Biggs Junction with Maryhill, Washington. 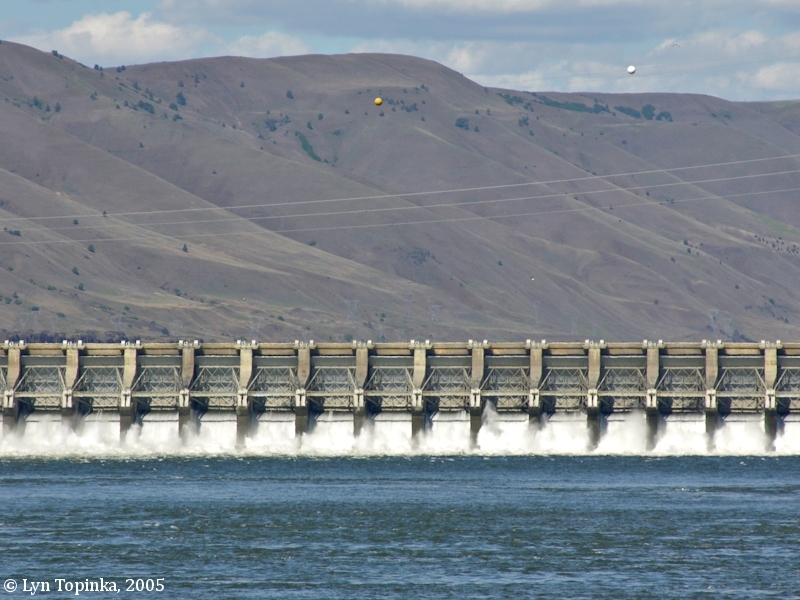 The John Day Dam consists of a navigation lock, spillway, powerhouse and fish-passage facilities on both shores. Construction of the John Day began in 1958 and was completed in 1971. At the time of it's completion, the John Day Dam Powerhouse was the second largest in the world. 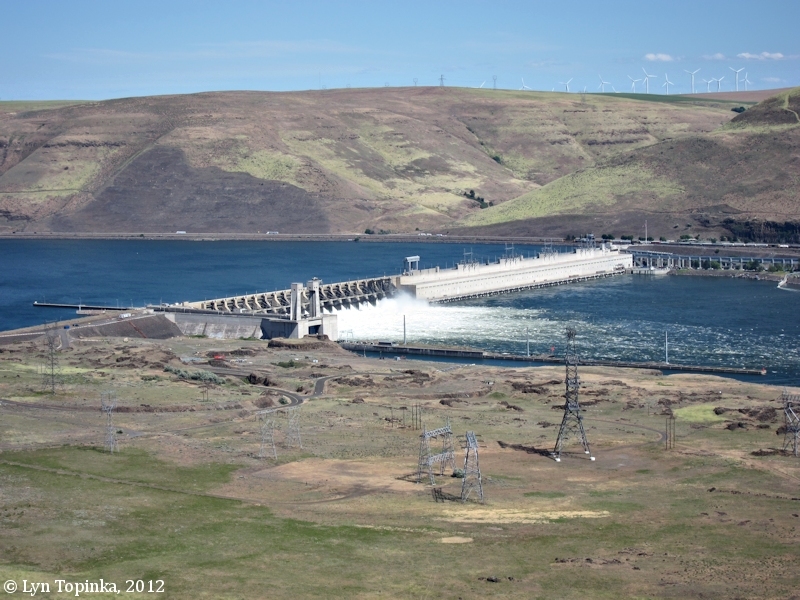 Completion of the John Day Dam marked the final step in harnessing the lower waters of the Columbia River. 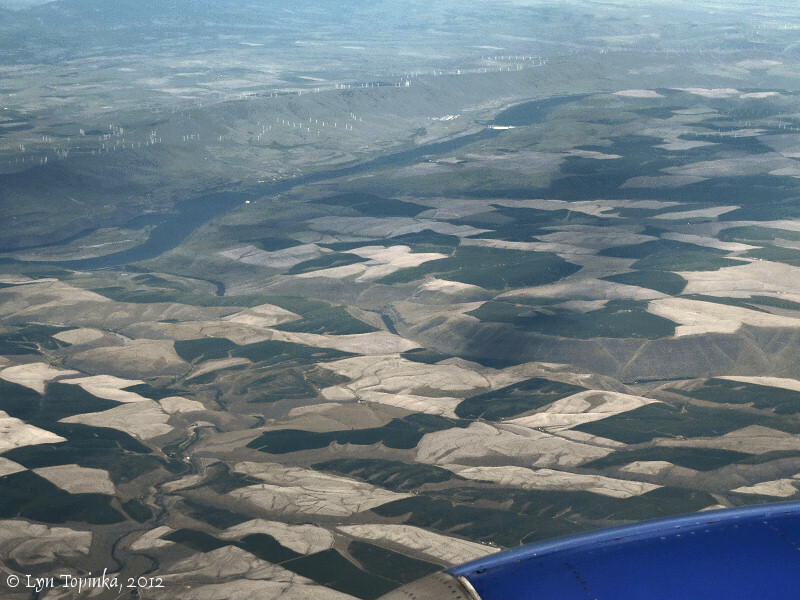 Click image to enlarge Columbia River from Miller Island (left) to the John Day Dam (right), including the Deschutes River drainage and the wind turbines on the hills below Goldendale, Washington, as seen from airliner heading towards PDX. Mid afternoon, clouds, gray, and drizzle. Image taken April 24, 2012. 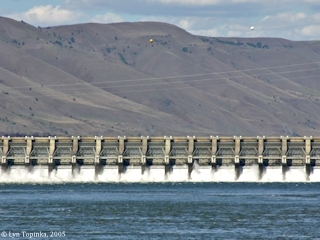 Click image to enlarge John Day Dam, as seen pullout on Interstate 84. 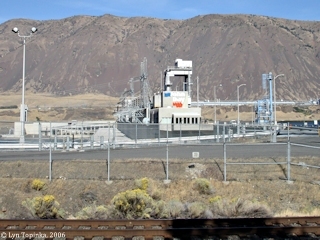 Image taken October 2, 2006. Click image to enlarge John Day Dam. John Day Dam, as seen from Giles French Park. Image taken September 26, 2003. Click image to enlarge John Day Dam, as seen from near Giles French Park, Oregon. Image taken May 24, 2005. 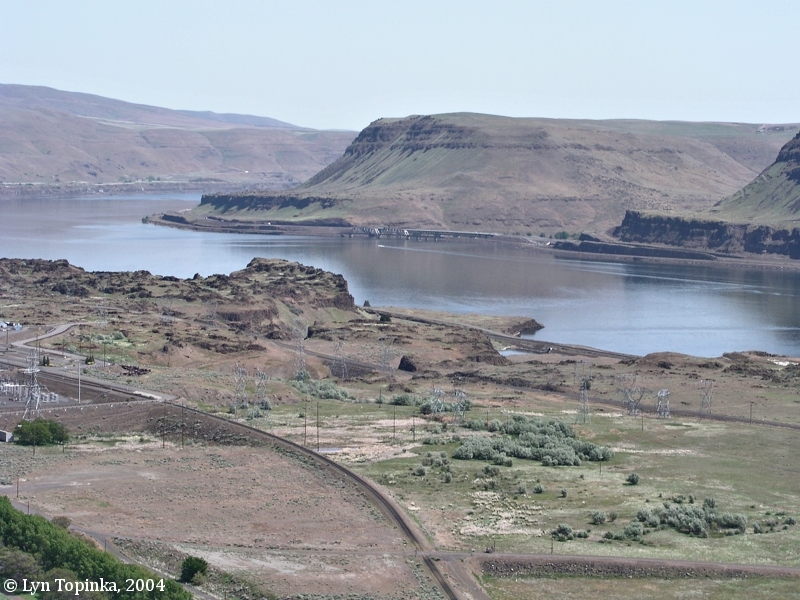 Lewis and Clark's Campsite of October 21, 1805, was on the Washington side of the Columbia River, just downstream of today's John Day Dam. Lewis and Clark's previous campsite was upstream on the Washington side of the Columbia near the town of Roosevelt. 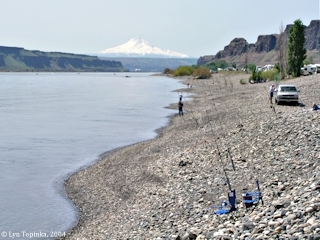 Their next camp was downstream near Wishram, Washington. 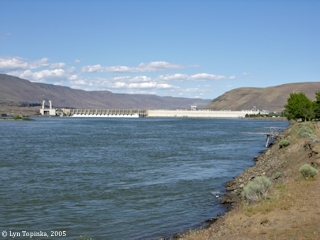 Click image to enlarge John Day Dam as seen from Washington State Highway 14. 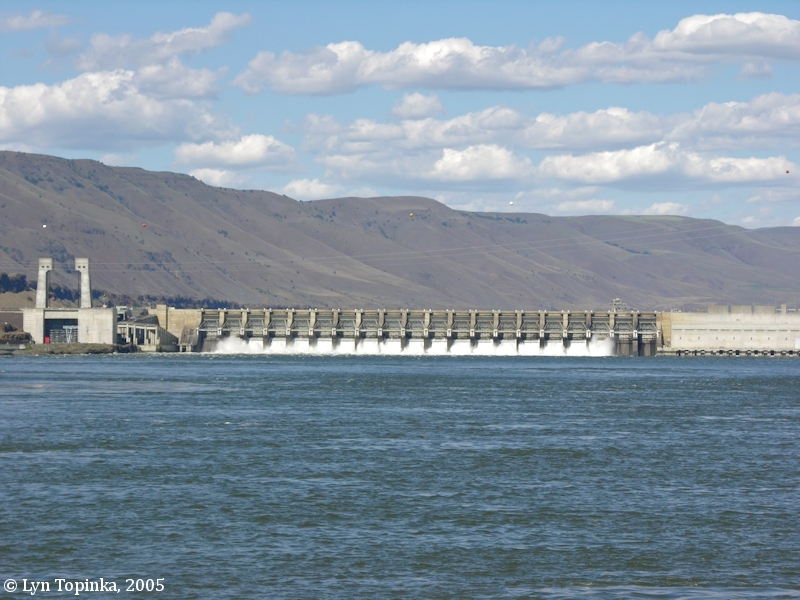 On October 21, 1805, Lewis and Clark camped on the Washington State side of the Columbia River, just downstream of the John Day Dam. Image taken June 6, 2012. 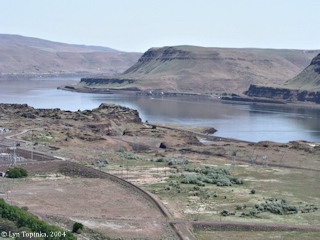 Lewis and Clark's campsite of April 22, 1806, was on the Washington side of the Columbia River upstream of today's John Day Dam. The route map [Moulton, vol.1, map#77] shows the camp to be almost directly across but yet a bit downstream of the mouth of the John Day River. 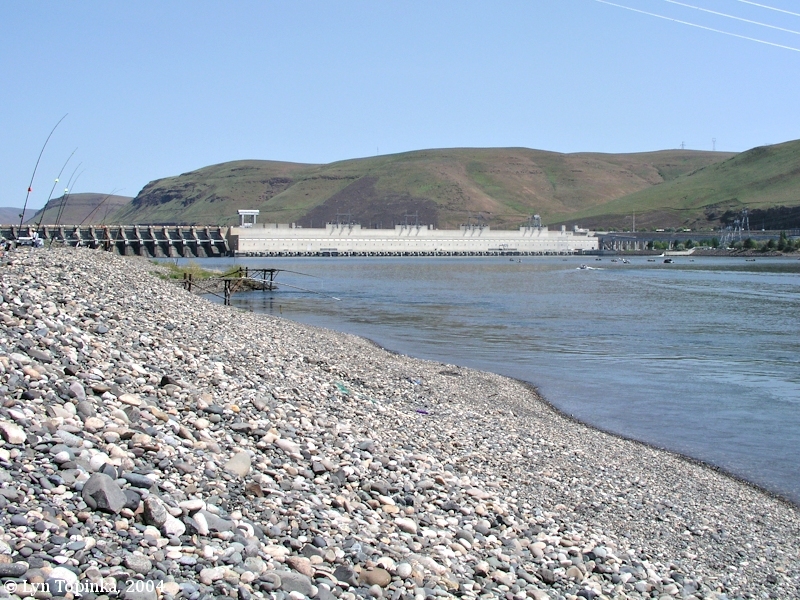 Oddly, Lewis and Clark make no mention of the John Day River in their journals for this day [vol.7]. The map has two labels for April 22, 1806, but only one "camp flag". On the Washington State side of the river is labeled "Encamped 22d April 1806" and on the Oregon side is marked "Campd 22d April 1806". 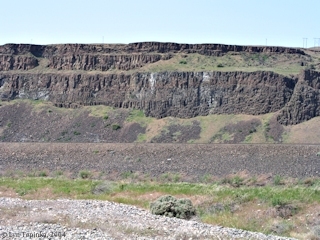 Their previous camp near the John Day Dam on October 21, 1805, was located downstream of the dam. Lewis and Clark's previous campsite was located two miles upstream of Wishram, Washington at the base of Haystack Butte. Their camp of April 23, 1806, was upstream of Rock Creek, Washington. 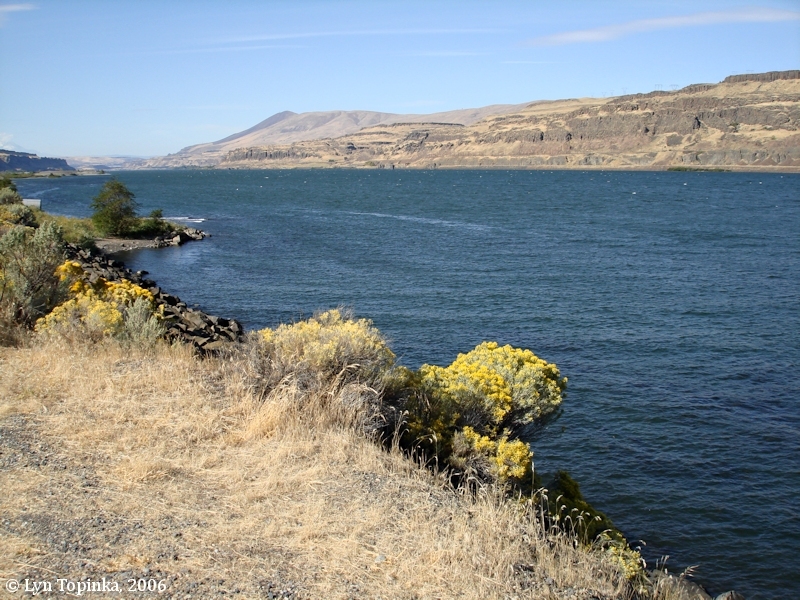 On the night of April 21, 1806, Patrick Gass and three other men were on the Oregon side of the Columbia and did not make the river crossing to rejoin the main group camped on the Washington side near Haystack Butte. 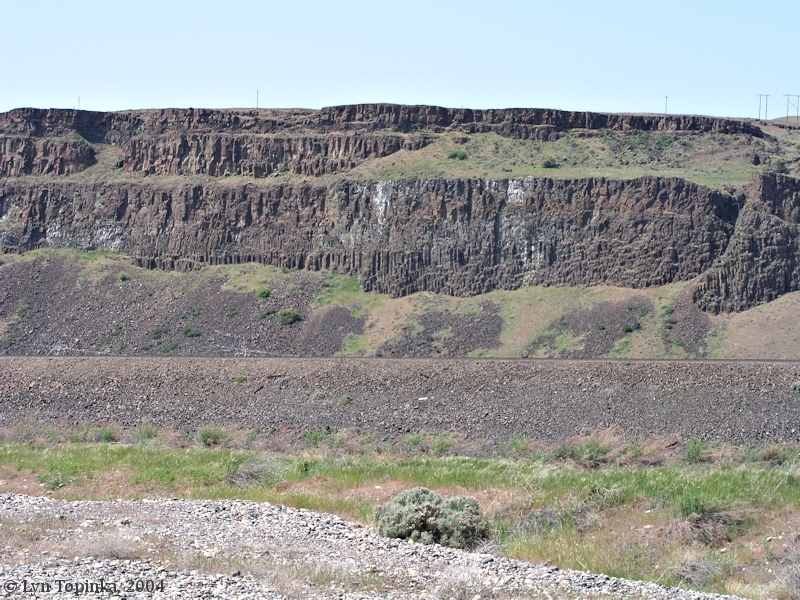 They camped on the Oregon side upstream of the mouth of the Deschutes River, closer to today's John Day Dam and the town of Rufus. 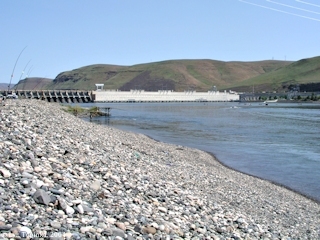 Patrick Gass re-joined the main unit of the Lewis and Clark group the next day and he spent the night of April 22 camped with them on the Washington side of the Columbia upstream of the John Day Dam. A canoe of Colter and Potts however spent the night of April 22 on the Oregon side of the Columbia. While Patrick Gass spent the night of April 21 on the Oregon side of the Columbia, he re-joined the main unit of the Lewis and Clark group on the 22nd. The canoe of Private John Colter and Private John Potts however couldn't make the crossing and they spent the night of April 22 on the Oregon side of the Columbia River, quite possibly near the mouth of the John Day River. Cliff Park lies on the Washington side of the Columbia River below the John Day Dam, and presents a great view upstream of the dam, and downstream of Mount Hood, Oregon. 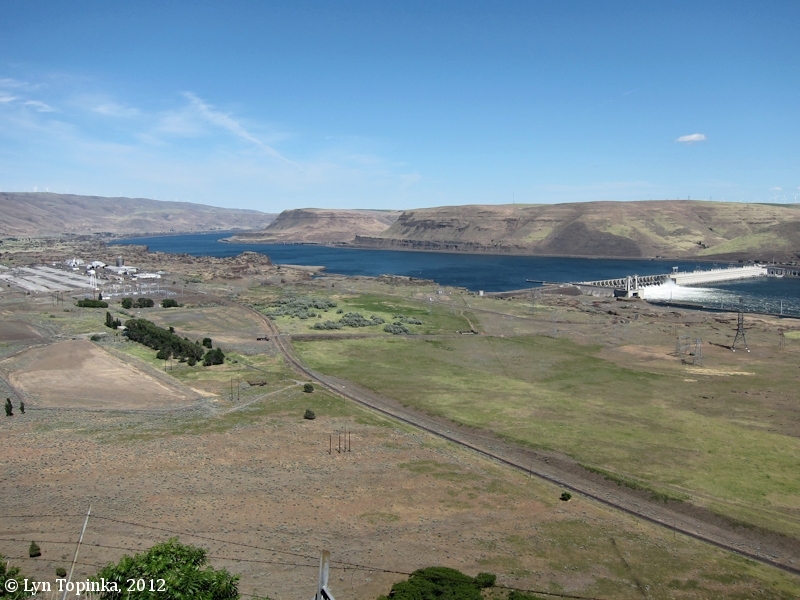 Click image to enlarge John Day Dam from Cliff Park, Washington. Image taken April 24, 2004. Click image to enlarge Looking downstream towards Mount Hood, Oregon, from Cliff Park, Washington. Image taken April 24, 2004. Click image to enlarge Cliff behind Cliff Park, Washington. Image taken April 24, 2004. Giles French Park is a U.S. Army Corps of Engineers Park which lies on the Oregon side of the Columbia River below the John Day Dam. The park was named after Giles French, a Sherman County historian and for many years the Publisher and Editor of the Sherman County Journal. Giles French was honored in the Oregon Newspaper Hall of Fame in 1994. 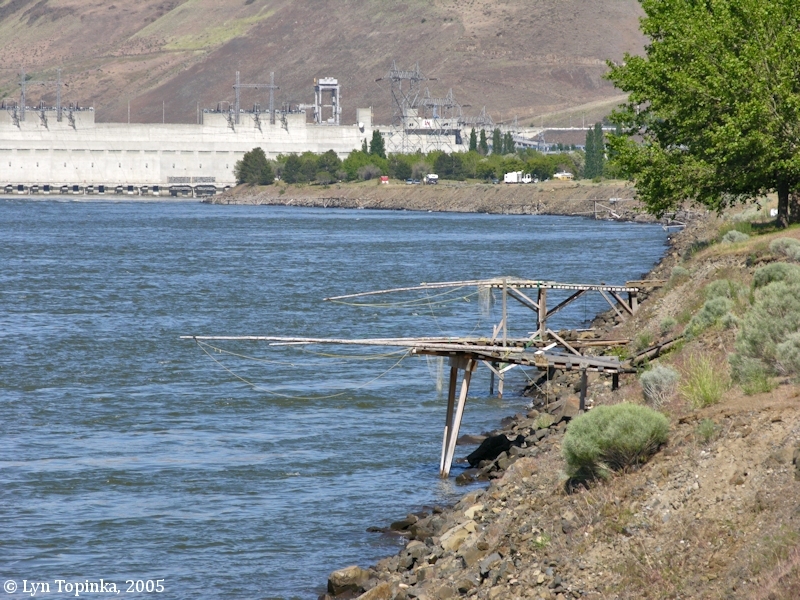 Click image to enlarge Fishing platforms and Giles French Park, located below the John Day Dam, Oregon. Image taken May 24, 2005. Lake Umatilla is the reservoir behind the John Day Dam. 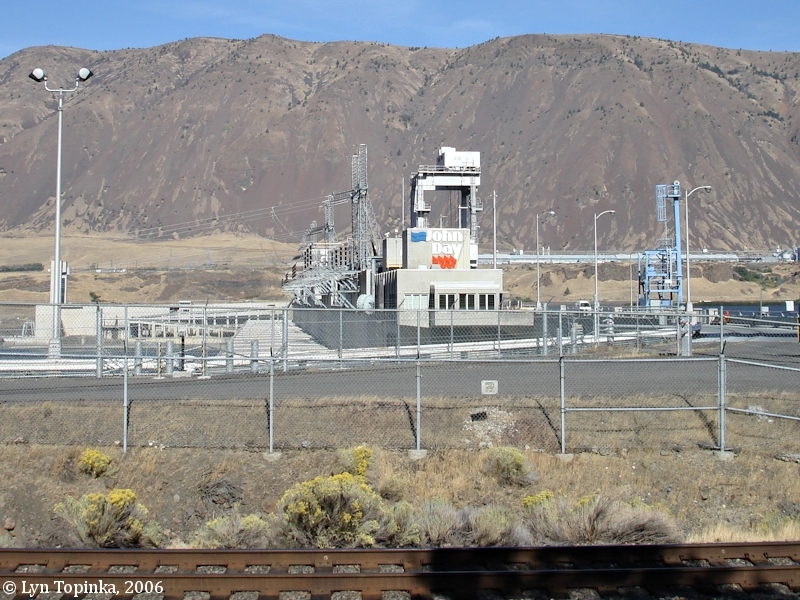 Rufus is the small Oregon community which lies two miles below the John Day Dam. 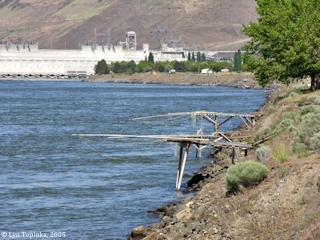 Click image to enlarge Columbia River as seen from downstream of John Day Dam, at Rufus, Oregon. Image taken October 2, 2006.
we proceeded on through an open plain country about 8 miles to a village of 6 houses of the Eneshur nation [near today's Maryhill Museum], here we observed our 2 canoes passing up on the opposite side; the wind being too high for them to pass the river they continued on. we halted at a small run [historians suggest perhaps Harley Canyon] just above the village where we dined on some dogs which we purchased of the inhabitants and suffered our horses to graize about three hours. there is no timber in this country we are obliged to purchase our fuel of the natives, who bling it from a great distance. while we halted for dinner we purch a horse. after dinner we proceeded on up the river about 4 miles to a village of 7 mat lodges of the last mentioned nation [vicinity of the John Day Dam. here our Chopunnish guide informed us that the next village was at a considerable distance and that we could not reach it tonight. the people at this place offered to sell us wood and dogs, and we therefore thought it better to remain all night. a man blonging to the next village above proposed exchanging a horse for one of our canoes, just at this moment one of our canoes was passing [Patrick Gass and Reubin Field]. we hailed them and ordered them to come over but the wind continued so high that they could not join us untill after sunset and the Indian who wished to exchange his horse for the canoe had gone on. Charbonoe purchased a horse this evening. we obtained 4 dogs and as much wood as answered our purposes on moderate terms. we can only afford ourselves one fire, and are obliged to lie without shelter, the nights are cold and days warm.— Colter and Pots had passed on with their canoe.